What does your church board do? What do they focus on? What are their priorities? 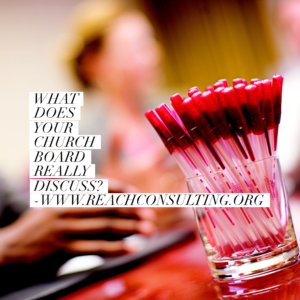 We often hear opposing views about church boards. From the board members, we are told that most of their time meeting as a group is to discuss ministry at the church. The business aspects like finances, facilities and staffing is always a small part of the discussion since those things are indeed important. But they’re always confident that most of their discusses revolve around actual ministry, vision, mission and purpose. From church members, we hear something completely different. They complain that the board rarely discusses the real ministry needs and always focuses on the business aspects of the church, the finances, staffing, etc. When we ask how the church members know this (since they typically are not present), the usual response makes a lot of sense: “It’s all the board members talk about afterwards!” Typically, in the days and weeks after each board meeting, eventually the decisions the board made are communicated (or leaked) to the members of the church. It’s an understandable dilemma. What the board needs to focus on and what the people want the board to focus on do not always line up. While doing an analysis of the needs of the church, we find the best way to truly find out what the board discusses is quite simple. Read the minutes of past meetings! Most boards take some form of minutes to document the discussion for both historical and legal purposes. While typically not exhaustive in details, they do generally present the topics at hand. Good minutes will provide topic, who presented, the general discussion that took place, and the outcome if a vote of some kind was taken. Really good minutes have the time that the discussion took place. This allows you to see exactly how long the discussion was for each topic. When working with churches, we often request to see all the minutes taken for the past couple years and sometimes up to five. Reading them in one sitting can often give great insight into the church. Through board minutes, read as a linear timeline, much like a book, the history of church decision-making starts to become very clear, for better or worse. 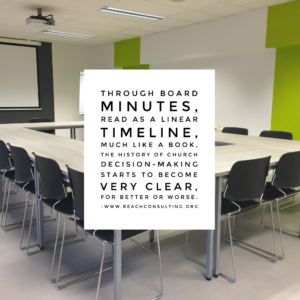 Board minutes can often give great understanding of the direction of the board (and church), the overall ministry, staffing issues, frustrations, finances, or other problem issues. In many cases, we can discern where a problem started to creep up either due to a particular decision being made or an issue was simply ignored. The same is true for wonderful ministry growth. We can often see where great decisions were made and then follow them through to show how the ministry benefited from that great decision. Want to know what your board is truly discussing? Want to know whether their focus is on ministry or vision or business or finance? Read the minutes. If your board doesn’t take minutes or if they show no usable data, then convince your board to start doing so. It’s important for both sides of the equation. The board members want to be able to show they do have the church ministry as their primary focus, rather than the business aspects. And church members want to see this is true. Creating and providing these minutes is in the best interest of everybody. Does your church board take detailed minutes? And do they publish them for all church members to see? Write us a note and tell us how past minutes have helped your decision-making for the future.